Click the button below to add the Clean and Brite to your wish list. 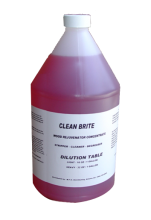 Clean and Brite is a concentrated, biodegradable, non-toxic, non-flammable, general purpose, butyl based cleaner, stripper, degreaser containing detergents, builders and water soluble solvents. 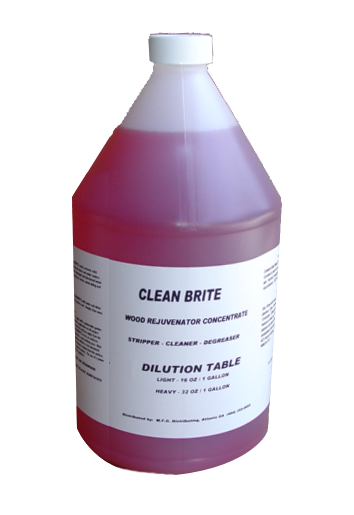 PRODUCT DESCIPTION: Clean and Brite Stripper and Cleaner is a highly concentrated alkaline formulation designed to quickly clean and restores cedar, asphalt/fiberglass shingles, removes dirt pollen, mildew and algae stains, cleans pine, cedar, redwood and cypress, restores original color to wood and roofs. Removes old, worn stains and sealers from wood surfaces prior to application of new finishes. Quickly restores outdoor weathered and heavily grayed wood surfaces. Clean and Brite Stripper and Cleaner will remove gray wood fiber, failed wood stains, tannin bleeding, water stains, mildew, algae and discolored surface fiber from decks, fences, wood siding and log homes. Use to restore wood to its natural color and prepares surfaces for re-coating. APPLICATION: Clean and Brite Stripper and Cleaner is manufactured to quickly remove solid color or semi transparent oil-based stains and water sealers. Clean and Brite Stripper and Cleaner will also remove damaged and discolored wood fiber from exterior surfaces such as decks, wood siding and log homes, Vinyl Siding * Fencing * Patios * Asphalt/Fiberglass Shingles * Slick Concrete Tile * Tile & Grout * Painted Gutters * Log Cabins * Cedar & Redwood * Gazebos. If paint and wood-paint removal is required use Clean & Brite. Heavily weathered wood surfaces may look fibrous after rinsing. Immediately brushing along the wood grain helps remove the loose fiber to give a smoother finish. Wood rich in tannin may darken during restoration - this is temporary. Using Clean and Brite Stripper to restore wood before a coating of stain or paint will help even penetration of the coating. The result will be a longer lasting, even and natural looking finish. DIRECTIONS: Clean and Brite Stripper works upon applying. Dilute Clean and Brite Stripper with water up to 9 parts (makes ten gallons). 9:1 will cover 2000 sq. ft. It stronger mix is needed, use 8:1 to 1:1 mix. For best results a minimum 1500 p.s.i. water pressure is needed for rinsing; in many cases residential water pressure is not sufficient to clean roofs. In such cases, use a low pressure, pressure-washer. WOODEN DECKS & SIDING, VINLY SIDING & FIBERGLASS: Use 3:1 strength on failed wood stains or heavily grayed wood. Apply diluted solution liberally with a pump-up garden sprayer to all areas to be treated. Mist area to maintain wet working area - do not allow drying on surface. Once coating softens, usually 15-30 minutes Agitate lightly with a stiff brush or floor broom to help remove residue. Work in the direction of grain to minimize "grain raising" on wood surface. Finally spray cleaned deck thoroughly with a garden hose or power washer to remove any cleaning residue. Rinse twice if needed and brush with the grain of the wood. For best results a minimum 1500 p.s.i. water pressure is needed for rinsing, In many cases residential water pressure is not sufficient to clean roofs. In such cases, use a low pressure, pressure-washer. TO CLEAN CEDAR SHAKE ROOF: Follow above instructions. Do not walk on shingles until rinsed and dried. TO REMOVE MLDEW, ALGAE, LEAF & DIRT STAINS FROM CONCRETE: Dilute 4:1 with water. Spray on generous coat, wait 10 minutes. either brush & rinse with hose, or pressure wash. Will not remove rust or motor oil stains. TO CLEAN ASPHALT/FIBERGLASS SHINGLES: Spray bad streaks first & again in spraying in operations. Start spraying at gutter. Work side to side & backwards to crest. Wait 10 minutes Start rinsing it crest. Wet 6 rows of shingles in front of you. Wait 5 minutes, rewet & wait 5 more minutes to make rinsing easier, other shingles will be wet by rinsing process. Hold hose and pressure wand about 12 inches from roof. On bad streaks hold about 6 inches or you may need to hold closer. Rinsed shingles can be walked on immediately without slipping. Rinse slowly until water is clear for a “new look roof” Avoid gutter overflow. Protect painted, stained & sealed surfaces from over-spray & runoff. TO REMOVE BLACK STREAKS FROM PAINTED GUITERS: Dilute Clean and Brite Stripper from 12:1 to 15:1 depending on type of paint and age. Test on a small area for correct mix. Adjust mix to suit job. Spray surface. Wait 10 minutes pressure wash. Note: If used on painted, stained or sealed surface, test to be sure it will not harm coating. Continue to dilute with water until safe mix is found. Use rubber gloves when handling concentrate & mix if skin is sensitive. Wear rubber sole & waterproof shoes. If heavy accumulation is present, re-spray those areas to get complete penetration before rinsing. TEST on new & and weathered wood for discoloration. Sprayed surfaces are slick, walk with care. Keep off bare aluminum and glass. Contains Potasium Hydroxide. Keep away from eyes. Wear safety goggles and rubber glows. Do not taste, swallow or breathe. When empty, reseal container tightly and dispose of carefully. KEEP OUT OF THE REACH OF CHIlDREN. Coverage: 1 gallon of diluted Clean and Brite Stripper covers 2000 square feet per 1 US gallon, depending on surface and amount of dillution with tap water.